If you've never really looked at a brick wall, you may never have noticed the mortar holding it together. But that mortar is key: it's the bond keeping the bricks -- and therefore the wall itself -- in place. 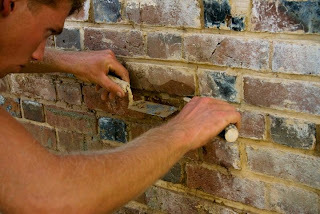 Using the wrong mortar or not replacing old, cracked mortar can damage the building. The process of replacing mortar is call tuckpointing. 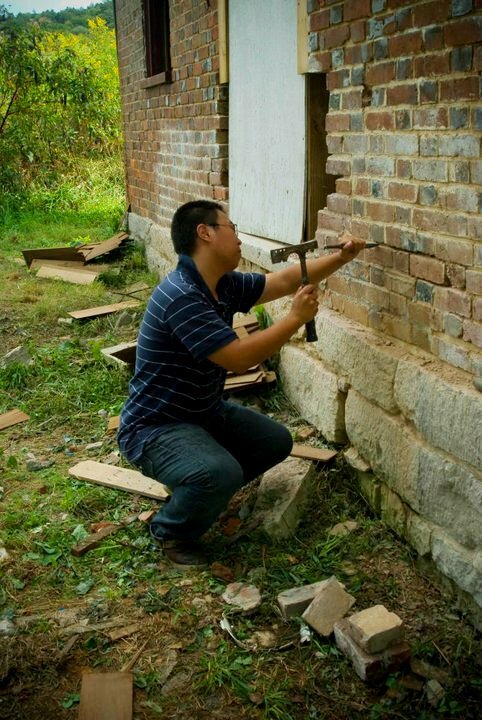 It's an extremely important task -- if the mortar in a brick wall is cracked, water can seep through into the walls, and then down come the bricks. We want the house to last for another century, so we take our time to do the tuckpointing right. 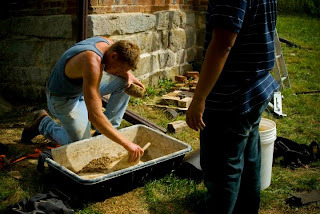 The Gardner House Team mixes its own mortar, similar to the kind the original builder would have used. A more modern, cement-based mortar would actually cause damage to the building. In fact, some of the mortar we've taken out was doing just that. Before you can add new mortar, you first have to get rid of the old. Tony is carefully using a chisel to chip it out. The next step is to tuck the new mortar in with a tool called a pointing trowel. That's what Adam is doing here. After that, all that's left is to smooth over your work and let it dry. 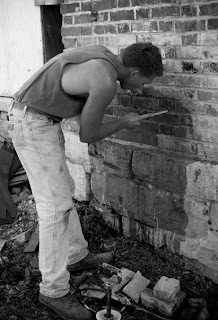 With the all-brick construction of the Gardner House, students have spent hours painstakingly removing the old mortar and replacing it with new -- and there's plenty of work yet to do. When you come to April's open house, take a close look at the walls and see the work they've done!